The creators of Atelier New Regime have found freedom through fashion. 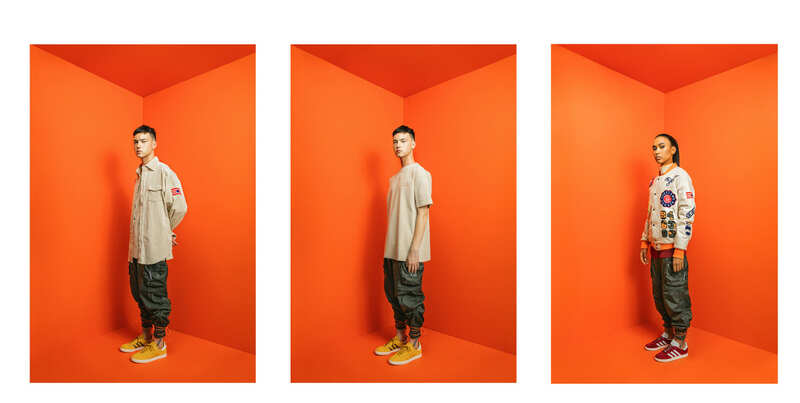 The interior of Atelier New Regime’s six-month-old flagship store, situated on a placid boulevard in Saint-Henri, just west of downtown Montreal, is entirely orange. Think of the first room in Destiny’s Child’s color theory-informed clip for “Say My Name,” or the saturated flesh of an overripe grapefruit. The walls, the floor, the small change room hidden behind a floor-to-ceiling mirror, and some of the product — like a jumpsuit emblazoned with the phrase “WORKING CLASS” — are all orange. Even the windows are entirely oranged out, hiding the small shop’s sparse interior from the street. For people who ascribe meaning to color, orange might represent optimism and vitality, imprisonment or freedom. But the three-partner ANR team — Setiz Taheri, 33, and brothers Koku, 26, and Gildas Awuye, 22 — insist the paint job is not that deep. The shop’s vibrant cocoon is, like everything they do, another way to bring consumers and fans into a world they envisioned when the brand first launched with simple slogan tees in 2009. (Gildas used to slang duffle bags of gear on his college campus, where the brand quickly found a consumer base). It’s a bit difficult to discern exactly what that ethos is from three self-taught guys who are disinterested in intellectualizing the sauce, but given their backgrounds — Taheri, now a dad, alludes to having been caught up in street life, all three are postsecondary dropouts — and a reliance on steady growth over elaborate schemes it feels like Atelier New Regime is acutely aware that it is the little brand that could. Their actual world is a specific segment of Montreal; multicultural, franglais-speaking, street-savvy, inspired by the aesthetic codes and increasingly refined tastes of hip-hop. “There’s origins of streetwear in what we do,” said Taheri, seated at a worktable in the shop’s bright, neutral-walled basement. “At its core streetwear is what we started off doing, like printing messages on shirts, political ideas, and expression through clothes. But then there are ideas of a higher level of fashion somewhere in there too.” From pastel basketball jerseys, to quilted thigh-length Barbour-style overcoats, limited edition velours (a collaboration with the Montreal boutique Off The Hook), and thoughtful detailing on heavy cotton polos and turtlenecks in muted tones, Atelier New Regime sharply elevates seasonal staples. The Fall Winter 2017 collection, École Buissonière (a French expression for cutting class) features collegiate basics, whether your uniform is tracksuits or stripy polo long-sleeves. Taheri and the Awuye brothers all dropped out of postsecondary schooling, but “the fact that you drop out doesn’t mean it’s the end of it,” said Koku. “That’s a story we lived and I think a lot of people [believe] that once they quit school, that that might be it.” To wit, the business-minded baby of the crew, Gildas, masterminded their move into cut-and-sew entirely through Google-abetted trial-and-error. He’s now making twice-yearly trips to the production factory in China. Every message isn’t literal, Taheri insists, but the personal story is New Regime’s way of staying close to their immediate community, and building a like-minded, increasingly global fanbase.